These apartments are set in a restored 19th-century building in a quiet area of central Llanes. Sablón beach is just a 5-minute walk away. The Apartamentos San Roque are located in the far east of the northern Asturias region, in an area known as Green Spain. In the historic centre of this pretty seaside town, the apartments are a short distance from the promenade and harbour. The surrounding coastline is one of the most impressive in the country, with many beautiful beaches, and the mountains of the Picos de Europa are just to the south. The individually decorated apartments can accommodate between 2 and 6 people – ideal for families and groups of friends. Make yourself at home in one of the 14 guestrooms. Private bathrooms with bathtubs feature complimentary toiletries and hair dryers. Make yourself at home in one of the 36 guestrooms. Complimentary wireless Internet access keeps you connected, and cable programming is available for your entertainment. Private bathrooms have designer toiletries and hair dryers. Conveniences include phones, as well as safes and desks. This hotel is perfect for a pleasurable stay, as the beach, with its whole range of entertainment, is just a few minutes away. Of particular note are the panoramic views of the mountain, of the garden and of the swimming pool. The24rooms at the hotel have been designed to make customers as relaxed as possible during their stay. We have Cot for children. Facilities include Air Conditioning and Heating. Make yourself at home in one of the 20 guestrooms, featuring kitchenettes with refrigerators and stovetops. Flat-screen televisions are provided for your entertainment. Conveniences include microwaves and coffee/tea makers. Make yourself at home in one of the 32 guestrooms featuring minibars and flat-screen televisions. Complimentary wireless Internet access keeps you connected, and digital programming is available for your entertainment. Private bathrooms have deep soaking bathtubs and complimentary toiletries. Conveniences include phones, as well as safes and desks. 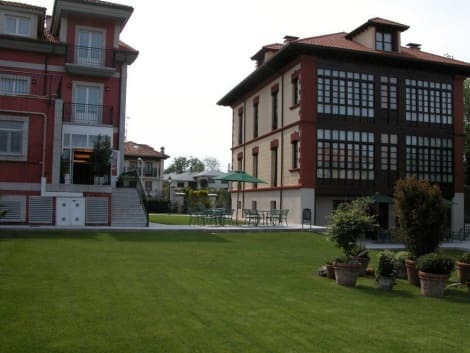 This hotel lies at the heart of the village of Llanes. The property is situated close to the beaches of Sablon and Toro. The area is renowned for its natural beauty, with mountains and the sea surrounding the hotel. This charming hotel blends effortlessly with its stunning surroundings. The guest rooms are superbly designed, offering a comfortable space in which to work and rest in comfort. The hotel offers a wonderful breakfast in the mornings, ensuring a great start to the day. This charming hotel offers a range of facilities and services, ensuring the utmost in comfort of business and leisure travellers. Located in Llanes, Hotel La Boriza is by the sea, a 3-minute drive from Castru La Ballota and 8 minutes from Ballota Beach. This hotel is 2.5 mi (4 km) from La Islona and 3.6 mi (5.9 km) from Toro Beach. Make yourself at home in one of the 49 guestrooms. Complimentary wireless Internet access keeps you connected, and satellite programming is available for your entertainment. Bathrooms with bathtubs or showers are provided. Conveniences include phones, and cribs/infant beds (complimentary) can be requested. lastminute.com has a fantastic range of hotels in Llanes, with everything from cheap hotels to luxurious five star accommodation available. We like to live up to our last minute name so remember you can book any one of our excellent Llanes hotels up until midnight and stay the same night.